In August of 2010, Write on New Jersey reported the previously untold story of a fourth B-29 in the skies over Hiroshima on August 6, 1945 and of the military photographer on board who captured the image of the first atomic bomb explosion. Denied by official sources for more than half a century, the story of John McGlohon, the photographer in question, was investigated and authenticated by an independent investigator, Ken Samuelson. Today, it is the distinct honor of Write on New Jersey to be the exclusive publisher of John McGlohon’s memoir of his military service and that fateful day in 1945 that signaled the official beginning of the atomic age. The accounts in this article are from two separate writings of Mr. McGlohon. The first chronicles his overall military experience from 1941 to 1945. The second entitled Seconds Made the Difference provides more detail on the events of August 6, 1945. The articles are unedited and are the unfiltered words of Mr. McGlohon. We at Write on New Jersey sincerely hope that you will find Mr. McGlohon’s story as compelling as do we. On June 9th, 1941 Brindord Bulla drove me to Winston-Salem to spend the night in his apartment and in order for me to go to the Army recruiting office the following morning. He dropped me off as he went to work and I spent the morning joining what at that time was the Army Air Corps. When asked by the Recruiting officer where I would like to be stationed I told him I’d like to go as far as he could send me. His answer was, I can send you to Hickam Field , Hawaii but if you go there you will only have 30 days leave each year and it will take you fifteen days to get home and fifteen days to get back. I decided that I best not go that far and it was a good decision for I would have been at Hickam Field on December 7, 1941 when Japan attacked. After offered several other options I decided I would go to Maxwell Field in Montgomery, Alabama. That afternoon I was taken to the depot and given a ticket to Charlotte where I would spend the night and visit the office there the next morning to be sworn in. I spent the night in the Mecklenburg Hotel and early the next morning I walked to the Court House and was sworn in. Given a ticket to Montgomery I was put onto the train and headed South. I arrived at the depot in Montgomery around 02:00 in the morning and was met by a soldier with a 2 ½ ton Army truck. Riding alone, in the back of the truck I made by first appearance on Maxwell Field. I was issued a mattress cover and a mess kit and was asked for my serial number. When I told the fellow that they had not given me one yet he said “oh yes they have, your number is 14049555 and don’t ever forget it”. From there I was taken to the only aircraft hanger on the base and given a cot to place anywhere in the hanger I wanted to put it for that would be my home for several days. I waked, at daylight to see another cot beside mine and a fellow turned to me and said “I’m Bill Ivey, who the hell are you?” . Within a week the hanger was filled with cots as new personnel was being brought in by truck every day and night. AT-6s, advanced training aircraft were going by the hanger day and night and it made sleep impossible at times. After about a week we were all moved into a tent city across the base, away from the flight-line and began basic training. Close order drill, military orders, PE and the works kept us busy most of the day but if they ran out of anything for us to do they let us sweep streets, dig ditches, or mow grass. I volunteered to help in the kitchen and got a job as a butcher so I got out of lots of ditch digging as I worked mostly at night in the kitchen. Learning that a combat unit was being organized on the base I went over to the basement of Austin Hall, the Administrative Building, and met an old Master Sgt. Barron Powers acting as First Sgt. and asked if there was a chance to being transferred to the new unit. He asked what I could do and I told him I could do anything he needed done. He said he was needing a clerk in the Orderly Room to do paper work. Having had typing in High School I told him I could handle that so he told me to go back to the recruit camp and tell them to transfer me over to his unit. When I went into see the Sgt. He told me that I was on orders to leave the next morning for Moltier , Ga. To a School Sqdn. And that he couldn’t transfer me. I went back to Sgt. Powers and when I told him he picked up the phone and called over to tell them to move me that afternoon. That evening I found that I was now a member of the 3rd. Photo Mapping Squadron. The Orderly Room was at the end of the hall in the basement of the building and rooms on either side of the hall were all darkrooms used for developing and printing photographic work, developing on one side of the hall and printing on the other side. After a few days in the Orderly Room, and not being too busy, I would go into the darkrooms to watch the old fellows work. Once in the room you couldn’t get out until the film was developed or prints made so many times when they needed me in the Orderly Room I found myself locked in the darkrooms. To my good luck they got another man in the Orderly Room and left me to train with some of the finest fellows I’ll ever know. Old Regular Army fellows, Sgt. Jimmie Pierce, Sgt. Mathis, Sgt. Shrott and Sgt. Weaver who took me under their wing and taught me the business of photo work. The Squadron. Moved from Maxwell Field in late Summer to what was called “The Old Mill” in downtown Montgomery as there was no longer space for us on the field and the old mill building was not being used at that time. On Sunday morning December 7, 1941 I took my quarter, saved from the seven dollars that I had to spend for the month and went into town. We were paid twenty one dollars each month but I had seven dollars sent home and seven dollars taken out for PX checks so I was left with seven dollars for the month. Spent a nickel to ride the bus to town and went to church, spent a dime to get into a movie and had a nickel box of popcorn and had five cents left to get home on. As I was watching the movie the lights suddenly came on and the curtains were closed as a man walked onto the stage and said “all military personnel are to report to their base immediately as Pearl Harbor has been bombed”. From that minute on we were on a war time footing and things changed quickly. On the 27th. Of December the Squadron. Moved, by motor convoy from the Old Mill to MacDill Field in Tampa, Florida. Just before we left I was asked by Sgt. Pond, from the motor pool, to ride “shotgun” with him to lead the convoy through the towns we would come to. Given a 1903 Springfield rifle, the first and only time I ever had one while in service, I rode in the front of the Jeep with him and we would find the way through or around the towns as we came to them. We spent one night in Tallahassee, on the campus of the University of Florida, before going on to Tampa. At MacDill we were assigned tents again and lived in them until two story barracks were built on the base. The Squadron. built a new photo lab for our own use but we also operated the Base Photo Lab and did public relations work for the base. I found myself there most of the time. My biggest goof-up while in service happened one day while at MacDill. One afternoon Sgt. Lopez asked me if I would develop some aerial film for him as he needed to go into town for some reason. The film had just been brought into the lab from a test flight to check if all the cameras were properly mounted and they needed the results as soon as possible. He told me that everything was set up in the dark room and I only needed to develop the film and get it to the lab. Chief. In the darkrooms standard procedure was to have developers on the left, a rinse in the middle and hypo on the right in the developing tanks. The moment I placed the film into the left tank I knew it was wrong as hypo is always cold and developers are not. I tasted the fluid in the tank and knew it was hypo. I immediately removed the film and rinsed it and placed it into the developer, knowing that it would do no good. Of course the film came out blank and was of no use meaning the mission would have to be re flown. In fear I found old Sgt. Shrott, the Lab Chief and told him what had happened. His comment was “ I want to see Lopez as soon as he is back”. I don’t know for sure just what happened between he and Lopez but he was told that just because he was “left handed” was no excuse to go against procedure and set up the chemicals wrong. I never heard any more from Sgt. Shrott. In the Fall of 1942 Sgt. Jim Allen and I were assigned to go with our first out of country mission to South America. Jim and I were to be Lab techs and once at our station, build and operate a photo lab to develop and print film taken by our flight crews. I never knew who had the nerve to pick two 19 year old kids to take on this job but it was great. Our mission was to consist of two A-29 Lockheed “Loadstars” and four Beechcraft C-45s which were designated as F-2s by the Army, all equipped with mapping camera set-ups called tri-metrogon where three cameras were mounted together and we capable of taking photographs from horizon to horizon. The afternoon we were preparing to leave MacDill Field our lead plane, piloted by the Sqdn. Commander, Major Houston, crashed on take-off and all crew members on board were killed. Not only was our CO killed but also our Engineering Officer and our First Sgt. We now had to re-group but within a few days the remaining members of the mission left for South America, short one A-29. With the F-2s we had to island hop on our way to South America and we stopped in Cuba, Haiti, Porto Rico, Trinidad across “Devil’s Island” landing in Caracas, Venezuela and into Georgetown, British Guiana and from there to Parameribo, Dutch Guiana and finally stopping in Belem, Brazil. At Belem we lived in an up town hotel but worked at the airfield where there was one old hanger that had been built by German’s in years past. While there I helped Sgt. Bill Liles, our parachute rigger, repack all of our parachutes on the hanger floor. One day while he and I were working in the hanger I opened a closet door and inside was a brand new Army C-3 camera unit, a 4 x 5 Speed Graphic, case and all. It appeared that it had never been used. Where it came from or what happened to it I will never know. I have often wondered if the Officer I turned it over to still has it. Living in the hotel we had time to see the city of Belem and enjoyed it very much. Leaving Belem we moved on to our final location at Recife, Brazil just below the Equator. There were only a few Marines and a small number of other military personnel on what was a municipal airport and it was there that Jim and I were to build our lab. With very warm temperatures it was necessary to try to build the lab with light traps in the windows that would allow some air movement without letting in the light and we really had a problem trying to tell the native workers what we wanted. They could not understand just what we needed and not speaking their language made for lots of pointing and drawings. After the traps were finally completed, out of green lumber, the heat would cause the lumber to crack and we had to repair them with duck tape to keep the light out. Thanks to Jim’s ability with chemicals we were able to use hardeners that would allow us to develop film at temperatures much above that recommended or that we were used to using. We were finally shipped “temprite units” from Tampa that were supposed to be used to control developing temperatures. We soon found that there was hardly enough room in the units to both use for development and for storing our supply of rum and coke syrup. As planes would come down from Tampa, stopping in Porto Rico would pick up rum to bring down. We would use the C0-2 cartridges from our May West life vests to charge water to use with Rum and Cokes. One night, while alone in the lab around midnight there was a knock at the door and when I opened it the Base Commander, a full Bird Colonel. was standing there. I asked if I could help him and he said “ Sgt. I understand that a fellow might get a Rum and Coke here”. I could only say, how would you like yours. After that he was present almost every night. Our planes were flying almost every day and Jim and I had the lab in full operation. We would develop the film, make a set of prints and send them to Tampa on the next plane going up, then we would send the film up after we knew for sure that the prints had arrived safely. Most of the flights were mapping the coast of Brazil and up into the upper regions of the Amazon River over rain forests as far as the eye could see. When Sgt. Cain, one of our photographers became ill and had to be returned to the States, I was given his plane and started flying on the photo missions. In the F-2s there was only the pilot and photographer so we got to fly with most of our pilots at one time or the other. One pilot that I flew with most often, Lt. Schlinder, would take off and get the plane to altitude and tell me to hold it on course and he would go back to sleep. I got in a lot of pilot time that way. There was a beautiful beach about half a mile for the field and many nights, when it was so hot, we would take a blanket and walk down to the beach and sleep. In the mornings kids would walk by selling bananas and coconuts. For a nickel you could get several bananas. An early morning swim and we were ready to go back to work in the lab or flying. One late night as Sgt. Mark Johnsen, our radio operator, and I were working I was decoding messages as he received them from Tampa and one message read” send sizes of artic equipment for all men in your command”. I told Mark that I must have the wrong “code of the day” and he best repeat that message. Again it came back the same way and within a few days we found ourselves getting ready to return to the States for another mission in a different part of the world. As I arrived back at Tampa on a C-54 of Air Transport Command I was met by Sgt. Don Caughlin who introduced himself and told me that he would be the radio operator on our crew and we were to leave the next day on a new North American B-25 or F-7 and we were heading North. The first night we spent in Washington, DC and Don and I visited the home of a friend of his and spent the evening before going back to our hotel. The next morning we flew to Rome, New York where the plane was equipped with snow tires. We were still in our summer uniforms from the tropics. Leaving Rome we flew to Chicago, Ill. and nearly froze just getting out of the plane on the tarmac. Don and I went into town and got a room at the Blackstone Hotel and listened to the music of Les Brown in the dinning room. Next morning it was off to Camp Douglas, Wisconsin where we were issued all our Winter gear including snow shoes, skis and clothing. The little town near Camp Douglas was on a main line of the railroad and the town was split down the middle by tracks with fast trains coming through several times each day. We walked into town, as there was no dining facilities on the camp and found one café that was not expecting us. He did not have food on hand to feed us that night but he managed to get us something to hold us over and told us to come back in the morning. Over night he had stocked up and we were well fed for the few days that we remained there. One night the ladies of the town held a dance for us at a school and everyone really treated us well. From Camp Douglas we flew to Great Falls, Montana and checked the plane in at the sub-depot for some major work to be done on the exhaust system. Being no military base in Great Falls we checked into the Rainbow Hotel for the several days that we remained there. We would go out each day to watch the plane being worked on, mostly by young girls, and got to know some of them pretty well. Some of the crew dated some of the girls at night after work and our stay there was a lot of fun. Leaving Great Falls we flew to Edmonton, Alberta Canada then on to Dawson Creek and Fort St. John in British Columbia. Mapping, as we went, what would be the Alaska Highway we flew on to Ft. Nelson and to Watson Lake and Whitehorse in the Yukon Territory. At times these small fields were snow covered and only had a deep trench to land in and snow would be higher then the wings of the plane as we taxied into a hanger. From Whitehorse we flew to Anchorage, Alaska where we would stay for several days stocking up for our trip to our final base at a little Indian village of Naknek on the Alaska Peninsula. The only thing here was a native fishing village about a mile from the airstrip and a few American soldiers stationed a few miles away. Quonset Huts were the only buildings and the planes had to remain outside in the cold. Food was short as there were supposed to be two ships each year coming to supply the base and the one due at this time had been iced in about two miles off shore. We sent out hunting and fishing details when we weren’t flying but with little results. When it was determined the ice was thick enough a truck was driven to the ship and supplies brought back. Things improved somewhat then, at least in the food area. Our main mission was aerial reconnance of the Islands of Kiska and Attu where Japan had landed troops and a big battle was expected. We covered the invasion fleet in the harbor at Cold Bay and covered the area around Dutch harbor. After the Japs had been removed from the islands we were assigned to map all of Alaska and Western Canada so we had a chance to visit many locations in Alaska. We moved to Fairbanks and worked from there going to Nome , Bethel, McGrath, Point Barrow and other places I can’t remember. With this mission completed we left Alaska and flew to Spokane, Washington. A few days there and we flew to Denver, over night at Lowery Field and then on to Long Beach, California to put the plane in the depot for an overhaul. While the plane was being worked on I visited and stayed in the home of Don Caughlin and his mother in San Pedro. They were great people and Don and I visited the Rationing Board and got enough gas to drive to Riverside to see my brother who was a cadet there at the time. We were also given coupons for sugar which helped the family a lot and made Mrs. Caughlin very happy. With work on the plane completed we flew to Laredo, Texas and Don took me into Mexico to show me a different world. Was glad to leave that area and go back to MacDill in Tampa. The first night that we returned to Tampa Don Caughlin asked if I wanted to go into town that night and I told him I didn’t think I would but after he left the base I decided to go into Tampa and spend the night with a family from Asheboro who ran a hotel and provided me a free room any time I wanted to visit them. When I returned to my barracks the next morning there was a note from Don on my bunk saying that he had met my brother the night before in Tampa and that he was to leave the next morning from Plant Park. I took the bus back into town and went to Plant park only to find that my brother’s group had left the park and gone to the railroad station to be shipped out. I took a cab to the station and found my brother just in time to walk along the tracks with him as they were loading. At that time he told me he didn’t know why the government had spent all they had training him as he would probably only make a few missions after going into combat. My brother was an officer and a bombardier and was headed for England. It was the last time I would see my brother. In the Fall of 1943 I was assigned to a new crew and we gave up the F-7 for a Consolidated B-24 or F-9 that had already seen service in Europe. Our assigned mission this time was into the China, Burma, India theatre (CBI) where we were to map the “Hump” and the area of the Lido Road in Burma. With the F-9 we were able to fly from Florida to Natal, Brazil where we would head East across the Atlantic Ocean. Our first stop had to be the Accession Island as we did not have fuel enough to get to Africa. As we left Natal the last item put on board was a crate of carrier pigeons to be used in case of emergency. We did not use the pigeons but due to an engine malfunction we were forced to abort the flight and return to Natal. In order to reduce weight on the flight back we threw all unnecessary items overboard including the sports equipment that was assigned to the Sqdn. On our second attempt we made it safely to the Accessions Islands landing among all the birds. Our next flight took us into Africa landing first at Accra on the Gold Coast, then to Keno in Nigera, Khartoum in the Sudan, Asmara in Erteria, to Aden Arabia and on to Karachi, India. Finally we made our assigned base in a village of Guskara India. Our lab was based here but most of our flying was from British fields in the Assam Valley from bases at Yorhat, Dijon or Tezpur. From these fields, weather permitting, we could fuel up and fly across the mountains. We carried extra bomb bay tanks of fuel and had five gallon “Jerry” tanks on all the available space in the plane. We would fly through the mountains and land at Kunming, China. There we would leave some of the fuel for the “Flying Tigers” and with the reduced weight we could now make our return trip at an elevation needed for mapping the “hump”. Mt. Everest was always in our view as we made our trips back and forth. It was the monsoon season so many days rain and low clouds forced us to remain grounded. We slept in hammocks under the planes and found food anywhere we could. As we were not assigned to any local unit they would not feed us and we ate field rations most of the time. On occasions we would go into the jungle looking for bananas or fruit but we always had shotguns as we were told that we might run into a tiger in the jungle. One night, after we went to bed, sleeping in hammocks under the planes, a scream awoke us all to find one of the fellows peering through his mosquito bars looking at a cobra that was checking to see what was in the hammock. Needless to say, from that time on we all hung our hammocks higher from the ground. At some point I contacted malaria and was sent to Ondal for treatment. I woke one morning to find two medical officers sitting beside my bed and I was told that my fever hit 105 during the night. Doc Harrnet and the medics did a great job and I was soon back with the crew as we continued our trips back and forth over the mountains. With some time off we were able to get to Agra and visit the Taj Mahal, one of the worlds most beautiful buildings. With our mission completed in India we reversed our trip across Africa and back to the States only to find a new mission waiting for us. Arriving back at MacDill Field I was granted a two week leave and rode the train to Greensboro and a bus to Asheboro to be with the family. After a couple of days at home I had a relapse of Malaria and was in bed when I received a telegram from the Squadron. ordering my return to MacDill as soon as possible. Dr. J.T. Barnes sent word to my CO that I was not able to travel and a return telegram advised that I should return to base when able to travel. Several days later I rode the train back to Tampa only to find that the Squadron personnel had all left the day before by train headed for Salina, Kansas and Smokey Hill Air Force Base. Captain Wood told me that he was flying a B-17 out to Salina the next day and that I could go with him, again saving me a ride on a troop train. At Salina we learned that our Squadron was to be trained to fly the new Boeing B-29s that had just been introduced to the Air force. As there were few of the B-29s at that time our training was done in old B-17s that had been pulled out of service after action in Europe. With new crew assignments we flew almost every day on twelve to fifteen hour missions preparing for the long missions that we would find in the Pacific. My pilot with this crew was Lt. George Benedict and one of our gunners was Sgt. Wilbert “Stocky” Stockdale. One of our navigators was Lt. Mac Hyman who after the war wrote the book “ No Time For Sergeants” .with Stockdale as the main character. This book was later made into a movie with Andy Griffen. While we were training in Salina my brother died when his plane crashed in England killing all the crew but one gunner. I asked permission from the Exc. Officer to come home and was told that we were on twenty four hour standby and that it would not be possible to get any leave time. After calling my mother and telling her why I could not come home I met one of our squadron members who had his flight bag in his hand and I asked him where he was going. He told me that his father was in the navy and had just landed in New Orleans and that he had a three day pass to go see him. I went over the head of the Exc. Officer and spoke to Colonel McCarthy, our Squadron Commanding Officer and told him about my brother. He told me to pack a bag and they would fly me to the nearest airport. As I left the Orderly Room I told the Exc. Officer not to be where I could find him if we had a dark night with lots of shooting. I was flown, by Lt. Hartman to Greensboro and came home to be with mother and dad for a few days. Upon my return to Salina I had to turn in my leave papers to the Exc. Officer and he told me that I had been transferred. With this transfer I joined a new crew that I had not flown with before but a crew that turned out to friends for life. Captain Paul Gremmler was pilot, Lt. Jack Economos was co-pilot, Lt. Robert Herman was flight engineer, Lt. Pat Fyffe was a navigator, Lt. Gene Riddle a navigator, Sgt. Jerry Elkins our radio operator, Sgt. Eddie Laurie a gunner along with Sgt. Peter Caswell, Sgt. Bill Beiler and Sgt. Mike Durilla. As photographer I made up the entire crew. As the 3rd. Photo Reconnaissance Squadron was making plans to move to the Pacific as soon as the islands there were secure, our crew, along with three other crews were suddenly pull from the 3rd. And assigned as Flight “C” of 1st. Photo Reconnaissance Squadron and we were headed again for the CBI. This in the Fall of 1944. We were issued some of the first operational Boeing B-29s are as designated to us F-13s, ours, Number 42-24567 being the sixth B-29 to come from the factory at Wichita. Our crew, Lt. Nunzio Lazzaro’s crew and Captain Art Humby’s crew all left Salina at the same time and returned to India by the same route that we had traveled with our B-24s ( F-9). Our crew was first to arrive in India and when we landed we had been told that bomb crews would attempt to take our plane from us so we were told to guard the plane while our officers checked in. As I was perched high in the tail hatch one of our crew called me to say that a Colonel wanted to see the photographer. I swung down from the hatch and walked under the belly of the plane and came face to face with a full bird Colonel. I saluted and said Colonel Weaver how are you. He looked at me and asked how I knew him. I said we had met in the basement of Austen Hall at Maxwell Field when he was a Master Sgt. His first question was “ how is Hirshel Riggins“, one of the other old timers from Maxwell. The Colonel asked how quickly we could get the plane ready and fly a mission down in Burma. When Captain Grimmler returned to the plane he had orders to fly the mission that afternoon and we unloaded all our gear from the plane and loaded the cameras and flew our first mission in the area of Rangoon. We had been told in training that the Japs had no fighters that could reach our altitude and that their anti aircraft would not reach us. We found that we had been mislead as we had flak bursting around us and fighters above us. We were able to get our pictures and get out without any damage. We left India and flew first to Kunming China and later up to Chengtu from where for the next few months we flew our missions. These were flights going North as far as Mukden, Manchuria down covering all of the Korea Peninsula and East as far as the home island of Japan. We did sea search over the Yellow Sea looking for Jap shipping or war ships. On one mission we located Japan’s largest battleship in the harbor a Kure on the Sea of Japan. Breaking radio silence our Navy was alerted and soon was in contact with this battleship which was put out of commission. One of our flight crews, piloted by Captain Art Humby developed engine problems while over the Shantung Peninsula some twelve hundred miles from our base at Chentu and he and his crew were forced to jump. They were all picked up by Chinese troops and in eighty two days walked back to base. On one of our missions we had engine problems when we were within sight of Vladivostok Russia. Captain Gremmler asked the crew if they had rather go into Vladivostok and be interned for the duration or attempt to return to our home base. The crew choice was to head for home and we made it back far enough to land at an abandoned airbase and radio for an engine to be flown in to us. We replaced the engine and made it back to Chentu in time to meet with General Roger Ramey and he presented our crew with medals. Captain Gremmler received the Silver Star and Air Medal and the rest of the crew received Distinguished Flying Cross and the Air Medal. The medals were for a mission up to Mukden Manchuria where we first discovered what is now known as the “Jet Stream”. As we were supposed to be making our approach into the target area I watched a spot on my viewfinder which should have indicated our air speed to me. However I noticed that the spot I had picked out wasn’t moving and after timing it for several minutes I called the pilot and told him that we were not moving. We were facing winds that were traveling as fast in one direction as we were supposed to be traveling in the other direction and it was just a stand-off. Having used much too much fuel in our effort to make our target we had to abandon the mission and return to base. To our knowledge, this was the first time our Air Force had encountered the “Jet Stream”. We learned that in order to reach and photograph our targets in that area that we had to take a round about route and get above our target and then come back across target with the wind to our backs. With this we would have “ground speeds” around six hundred miles an hour and it made photographing our target very difficult. We learned by doing and passing on our information to other crews. At Chentu we had an elderly Chinese cook who had owned a restaurant in Shanghai before he was forced to leave by the Japs. He cooked on a marble grill and when we would go to breakfast prior to our flights, usually around 02:00 in the mornings, he would always be there to cook eggs for us and he would have a big pot of eggs already broken and ready to place on the grill. They were the best eggs I have ever eaten and it seemed you could eat a dozen with no trouble. He did a nice job trying to keep us fed. On one occasion he baked us a cake and rather then eat it that day we decided to take it to our tent and have in for some occasion later. We didn’t know that it had been made from rice flour and after the first day, after baking, it was as hard as a rock and we could only chip off chunks to eat. We also had two little Chinese nurses that had been forced to leave the hospital on the coast and flee the Japs. They had offered their services to the base and worked in the small medical unit there. One night a B-24 crashed just outside the building where they lived and they both ran, barefooted, to the crash area and attempted to drag victims from the crash. They were brave young ladies and I often wonder what happened to them after the war. In the Spring of 1945 we were ordered to leave China and rejoin the 3rd. Photo Squadron which was now on the Island of Guam. There we based at Harmon Field at Agana where our lab was located but in order to fly our mission we would have to move our planes to North Field for re-fueling as we could not take off at Harmon with a full fuel load. We would fly the plane to North Field on the afternoon prior to a flight and ride trucks back to Harmon Field, some twelve miles, to eat and get some sleep. Around mid-night we were driven back to North Field and pre-flighted the plane and usually took off about two in the morning. At times, if we were flying with a bombing mission we might see several hundred B-29s lined up down two runways waiting to take off and join hundreds more flying from the other islands for the same mission. Usually it was our assignment to fly alone either before or after a bombing strike. After take off we would fly at very low levels for several hours and begin climbing for altitude about an hour before we reached the coast of Japan. From around 25,000 feet we would then begin runs on assigned target areas taking photographs of future targets or of damage to past targets. We used either our tri-metrogon Mapping cameras or other spotting cameras mounted in the plane. Other then the mapping set-up we had a spotting camera ( K-18) with a twenty four inch lens that took a nine by eighteen inch negative and we had two (K-22s) stereo cameras with 40 inch lens, mounted in order to take overlapping photographs which could be studied in stereoscopic view helping to detect camouflaged targets. Our plane also carried a hand held four by five aerial camera (K-20) as well as a four by five Speed Graphic camera and a 16 mm Bolex movie camera. I carried a pass, signed by General Hap Arnold, authorizing me to photograph anything that I saw. As we had flown several missions from Guam to the home islands it became routine so on the morning of August 6, 1945 the crew of F-13 # 42-24567 with a crew consisting of Lt. Jack Economos, Pilot; Lt. Aubra C. Grice, co-pilot; Lt. Paul E. Riddle, Navigator; Lt. Pat C. Fyffe, Navigator; Lt. Robert W. Herman, Flight Engineer; Sgt. Gerald A Elkins, Radio operator; Sgt. Peter J. Caswell, Centrol Fire Control Gunner; Sgt. Walter E. Laurie, Blister Gunner; Sgt. Michael Durilla, Blister Gunner; Sgt. William H. Bieler, Tail Gunner; and Sgt. 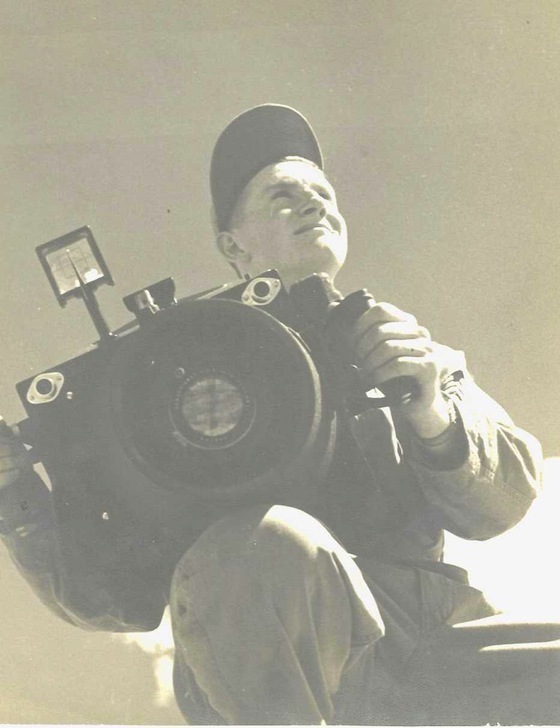 John A. McGlohon, Photographer left Guam around 02:30 in the morning on what we thought to be a routine mission. After reaching the islands as we approached the City of Hiroshima one of our gunners called over intercom to say he had just seen another B-29 headed back toward Guam. Within several seconds of the gunner making this statement there was a very bright flash of light from directly below our aircraft. My only vision was through my veiwfinder between my legs looking straight down. The flash was so bright and so different from others we had seen in days passed that I just turned on my cameras to record the up coming cloud. Not knowing the cause of the explosion we felt the plane we had seen must have salvoed his bomb load and hit an ammo dump. After turning no my cameras I picked up a K-20, 4 x 5 hand held camera and walked up into the blister and took pictures of the rising cloud as we flew on to the Northern islands as assigned. Only after returning to Guam late in the afternoon did we learn what we had seen and photographed. As I took my film from the flight into the lab I noticed film from Captain Omar Cox’s aircraft being captioned on the plotting board and their film showed a very small profile of this cloud on their 9 x 9 negative. I asked Sgt. Dornblazer what the image was and he said “ that’s an atomic bomb”. I told him if it was that we had taken portraits of it that morning and from behind me someone said “ if you did you will be dead by morning”. My first knowledge of just what we had photographed. This was August 6, 1945, the war ended on September 2, 1945 and I was discharged from the Air Force on October 10, 1945 at Fort Bragg so I had little time after taking the photo to learn what happened to it. It was some 40 odd years later that I, along with my wife and son, attended a reunion of the squadron at Tampa Florida. As we entered the hospitality room at the hotel there was a display of photographs taken over the years by the squadron and kept by Lt. Elmer Dixon one of our Lab. Officers. From across the room I saw this photograph and told my wife that was the picture I took. When we got close enough to read the caption is proved me correct. I had never seen the picture before as I did not see it after it went into the lab on Guam. I had told my story of having taken pictures that morning and because I could not explain just how we got there and why we were not dead I knew some people did not believe my story. Only after I was challenged by personnel of the 509th Bomb Group Mr. Kenneth Samuelson, a researcher, took three years to talk with all living personnel of the old squadron did he provide proof of our having taken the photograph. Seems two of our squadron aircraft had been ordered by General LaMay to fly with the Enola Gay team on the morning of the bombing but to stay 50 miles away from the target area. Captain Omar Cox and Lt. Tom Kendall flew these ships and members of those crews told Mr. Samuelson that they never got closer then the 50 miles however they did take long range photos and that was what I had seen when I took my film into the lab. After I told lab personnel that we had taken photos of the explosion our film was rushed through the lab and in the confusion was mislabeled with the flight number of one of the other planes. Captain Becker, our Operation Officer flew copies of all the film to Gen LaMay that night from our lab at Guam. As their intelligence officers could not figure out where our photographs came from they were not released as soon as other photographs. The 509th Bomb Group had stated to the public just where each of their aircraft were during the mission and that they were the only aircraft in the area they didn’t admit someone one else had to be there. The photos were finally released for publication on August 13, 1945 but the only place located where it was published was in a Military paper and that used an enlarged section of another negative from our roll of film. A researcher from Austin Texas called me many years later to advise that he had located an additional print from our film. Negative is on file at New York World Telegraph & Sun Collection having been received August 13, 1945. It is credited to : AAF PHOTO From ACME TELEPHOTO 8/11/45. I appreciate all the efforts of Ken Samuelson to prove our story which some personnel form the 509th Bomb Group still question. In the Summer of 1945 Headquarters of the 3rd Photo Recon Squadron was stationed at Harmon field on the Pacific Island of Guam and was assigned to the 20th Air Force. Our Flight, coming out of China and just reattached to the 3rd was designated as Flight “C” of the 1st Photo Recon Squadron, recently assigned to the 8th Air Force. Our assignments came through the Operation Office of 3rd Photo. Due to topography around Harmon Field, it was not possible for a fully loaded B29 to take off on a mission to the home islands of Japan so it was necessary for our crew, on the afternoon prior to a new mission, to fly our lightly loaded plane some 12 miles up the island to the cliffs of North Field. There we would gas the ship, load guns and cameras and do a preflight of the plane. Ground crew members would remain with the plane during the night and the flight crew would be trucked back to Harmon Field where we would have supper and get some sleep before being awaken around 02:30 in the morning. We would have breakfast and the pilots and navigators would go to briefings for instruction on the day’s flight while the flight crews, the engineer, radio, gunners and photographer would be driven back to North Field to recheck loadings and preflight the plane, pushing thru all the blades of the big engines to move oil around the cylinders before attempting to start. Upon arrival of the flight officers and final check of all equipment engines would be started and the tower would direct the pilot to our place on the long runway that ended on the cliffs at the North end of the field. With permission for takeoff throttles were advanced and we started our roll down the field and watched the water rise up below us as we dropped off over the Pacific. With several hours of flight time ahead of us, crew members made final checks of their equipment and as we flew over the Island of Rota we would test our guns to be sure they were ready. Some slept, some read and some just talked as we flew at low levels for the first part of the trip in order to conserve gasoline. As we came nearer to the Home Islands we would begin our climb to assigned altitude and the crew would put on “flack suits” and check our oxygen equipment including our “walk around bottles”. We wore harness for our QAC parachutes and made sure the parachute itself was near at hand as we flew into enemy air space. Having made several of these missions on other occasions, the morning of August 6th seemed no different from other flights. So as F13 number 4224567 went off the cliff at North Field that morning the crew consisted of Lt. Jack Economos as pilot and Lt. Aubra Grice as copilot. Lt. Paul Riddle and Lt. Pat C. Fyffe served as navigators and Lt. Robert Herman was flight engineer. Sgt. Gerald Elkins handled the radio with all these crew members working in the front compartment of the plane. Behind the bomb bay the gunners were in position with Sgt. Peter Caswell as central fire control, Sgt. Walter Laurie in one blister and Sgt. Michael Durilla in the other. Remote in the tail compartment was Sgt. William Beiler and Sgt. John McGlohon photographer was settled in his compartment just aft of the gunnery room. With a bank of six cameras at his feet and an APQ13 radar unit at his right shoulder the photographers only vision to the outside was beneath his viewfinder under the cameras looking straight down. Sgt. Elkins, our radio operator had planned to try making a recording of intercom conversation during the flight so we could have something to take home with us after the war. I never saw his equipment as his compartment was in the front of the plane and I would have had to crawl through a 40 foot tube over the bomb bay to get to where he was. Over the intercom he was testing to see if the recorder was working and he heard one of the gunners report seeing another B29 flying in the other direction. Within seconds there was a brilliant flash directly below our plane. It was as if someone had fired a giant flash bulb right into your face. The gunners in the blister and the pilot up front were temporarily blinded as they had no goggles or glove to protect them from the flash. From my only vision below my view finder I saw the contaminated cloud rapidly rising beneath the plane. I turned on my cameras and as Seconds made the Difference our cruising speed took us over the top of the upcoming cloud and into open air space prior to the radiated cloud reaching our altitude. I picked up a K20 hand held aerial camera and moved to one of the blisters as we continued on our assigned flight course and took pictures as the cloud rose to well above us. If there was excessive turbulence we didn’t seem to notice but that might have been from the shock of the bright flash. We continued on our assigned flight route as we had no idea just what we had seen and photographed. The discussion among the crew for the morning and the flight back to Guam as how different the flash had been. Sgt. Elkins played his recording over the intercom and the language was such that someone said they could never let their mother hear the recording so the record was destroyed prior to our reaching Guam to find what we had seen. Landing at Harmon Field in late afternoon as was custom a jeep picked me up along with the rolls of film that we had exposed during the flight and the rest of the crew were carried to Operations for a debriefing. When I reached the lab there was a lot of excitement and I was told to unload my film into the corner of the room. While I was in the lab I saw film that was being captioned as it was run across a viewing table and on one negative I saw a small silhouette of the cloud we had seen. I asked Sgt. Johnnie Dornblazer, who was working with the film what the object was and he told me “that is an atomic bomb”. When I told him that we had taken portraits of that cloud some one behind me said “ if you did you will be dead by morning”. That being my first knowledge of what we had photographed. The bombing happened on August 6th, the war ended on September 2nd and I was discharged from service on October 5th so I left Guam having never seen the pictures we took. Returning to my hometown I spent some 37 years with service with the Fire Department, the last 25 years as chief, and then some 16 years as a member of the City Council. All during these years I told our story to any group that would listen. I was asked many times just how we happened to be in the area and I could only say that I didn’t know. Some half century later I finally saw our photograph when I walked into the hospitality room at a reunion of the squadron and Captain Elmer Dixon, a Lab Chief had posted a group of photographs that he had brought home after the war. It was just as I remembered seeing the cloud rise beneath us. At this reunion I met with the five living members of the crew and we discussed our memories of the day. No one seemed to have any idea just how we happened to be over the bomb that morning and some suggested that we might have been just to tell the story if we got back. One member of the crew died thinking we were “set up”. For all the years after the war I had told the story of of our crew to schools, civic groups and anyone who was willing to listen. I know that some doubted the story but knowing it to be true I kept telling it. On one occasion, when I had been asked to speak to to a newly formed Vet’s group someone made contact with personnel of the 509th bomb Group and were told that I was not known to them and that I was just attempting to make a name for myself and that I should stop telling my “fairy tale”. At this point Mr. Ken Samuelson, a researcher who had invited me to speak began a three year research project speaking to every living member of the squadron who could add anything to the history. He gathered all the records, flight logs and recorded interviews with members. Finding that prior to the dropping of the bomb Gen. LaMay had requested two crews from the 3rd Photo squadron be sent to Titian to be briefed by the staff of the 509th group and these crews, Captain Omar Cox and Lt. Tom Kendall were told to stay 50 miles away from the target area. According to members of these crews that was their position on the morning of August 6th and the film I had seen in the lab was film they had taken from their position. In the lab our film was comingled with theirs and mislabeled with their flight number. Col. Becker, Operations Officer for the 3rd . stated that he, not knowing of the bombing, had sent us on a routine mission that morning and it was just an accident that we were in the area at the moment of the bombing. Seconds made the Difference as we flew over the radiated cloud that morning. As publicity from the 509th Bomb Group had positioned each of their aircraft during this mission they were at loss to determine where our photograph came from. First record found of it’s being released for publication was August 11, 1945. John McGlohon - who has written 1 posts on Write On New Jersey. I am happy to see a new author writing his biography of his service to our country in World War-ll. His contribution to ending that war is now part of history. As the Author of “The Veterans Corner” I am glad he wrote his story about his war years for his family & friends and the general public to remember little known events that happened during that conflict. In 2010 I wrote a strange story about an event that changed the course of history titled “The Mystery of the Fourth B29 at Hiroshima” This story was strange and fascinating of a recon mission that accidentally photographed the first atom bomb as it detonated over Hiroshima. John spent a lifetime telling his story to family , friends and groups of organizations that would listen. Now 69 years after that event it has been documented by Ken Samuelson a researcher as true. They say, Truth is stranger than fiction and this story is one of them. Congratulations John and thank you for your contribution. Awesome information on this site! Very interesting responses. Good job!